Last night a bunch of us headed up to Town Hall for what Hank had billed as "the Jonathan Coulton concert." It was raining fairly steadily, and parking was difficult. We ended up two blocks north of Town Hall, and paid $6 to park in a tiny lot near Virginia Mason -- this after peering at signs that seemed to indicate that most of the street parking required a local resident permit after 6 p.m. We didn't want to risk it. As we sloshed across the street toward the concert, we saw a dark Mercedes swoop into the "permit only" spot. A conservative-looking man in an expensive trench coat hopped out of the car and hurried off down the hill, carrying an oblong canvas violin case. He seemed somehow familiar, but who did we know who wore a trench coat and played violin? The fellow seemed to be headed to Town Hall, which was even more confusing, since Coulton's band has never included a violinist. Tom considered warning the man about the parking permit requirement, but by now he was far ahead of us, and there was something well-heeled and arrogant about him that made us think he could probably afford the ticket if he got one. 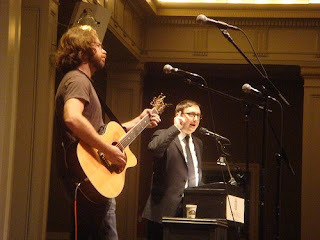 The Coulton "concert" turned out to be Coulton appearing in a supporting role for John Hodgman's book tour. Hodgman, the hapless PC in the Apple commercials, has just come out with More Information Than You Require, a second book of humorous essays. As he led the ensemble in a rendition of "Tonight You Belong to Me," we exchanged looks: John Hodgman was going to get a parking ticket. When the Q&A period came, I considered going up to the microphone and warning him. But I couldn't imagine myself saying "John, my question is: Did you know your car is parked illegally?" When the event ended and book signings began, Tom did go up and tell one of the event organizers about the car situation. We noticed on the way back to the parking lot that what seemed to be the same car was still there, as yet unticketed. And, if the Seattle parking folks did catch up with him later in the evening, perhaps he'll have a Seattle parking ticket story to add to his "minor television celebrity" tales. That's hilarious! Sounds like a really fun performance to have seen. I love Hodgson and Coulton in their respective wheelhouses, but to see them together... wow.